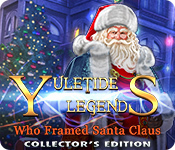 Brave Giant Studio presents the biggest holiday adventure of the season in the newest addition to the Yuletide Legends series! Save Christmas by healing Santa in the bonus game! 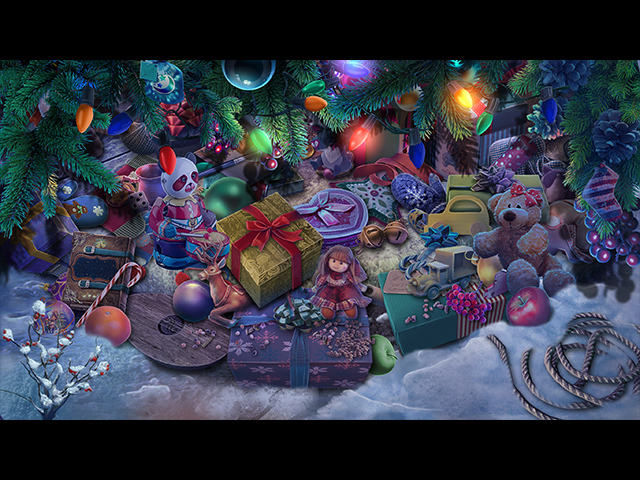 Replay the defeat of Krampus and the evil teddy in your favorite mini-games. Unlock achievements and gather character collectibles as you play! 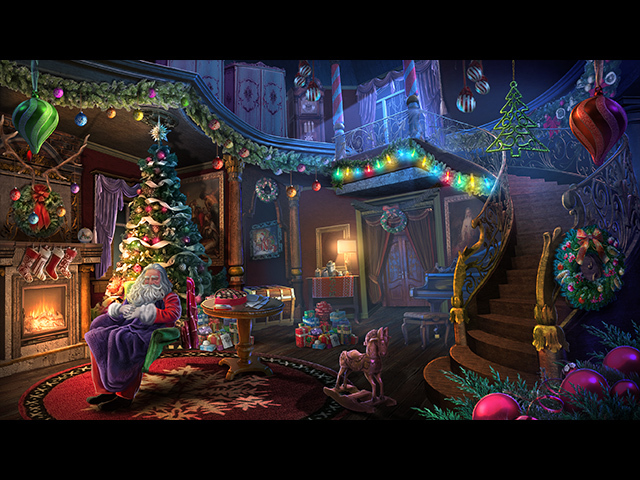 Yuletide Legends: Who Framed Santa Claus Collector's Edition is rated 3.5 out of 5 by 37. Rated 5 out of 5 by loopyerme from Are they crazy or guilty themselves? I played the demo until I found and bought the game as a collector's edition. I could not believe that someone, anyone, would dare to accuse Santa Claus of such a heinous crime. I mean, why would he do such a horrible thing? He is the man who works all year long to make wonderful toys for all the children of the world. I'm not just talking about the little ones here either. Someone has to come and fill all our stockings. After he does all that work, he then has 1 night to deliver his over-flowing sleigh of goodies around the world. When the police arrested Santa, they should have asked themselves when would Santa have had the time to commit any crime? Any crime like the 1 he's being accused of requires a lot of thought. Again, when would he have had time to plan it? This is truly a wonderful, fun gamed with replay value. Enjoy. Rated 5 out of 5 by baileyfx from Different enough to be great I really enjoyed this game. Not only were the visuals very good but the story line and graphics just had a totally different feel and look then anything before. Didn't seem like I was playing the same game all over again this Christmas. Believe it was a British production. Rated 5 out of 5 by Lisistrata86 from Christmas delight! Great game! Beautiful, fun game with good story and nice twist at the end. Loved it! Rated 5 out of 5 by docvelvet from Joyful I loved the beautiful colors of this game. The presents that appear when there is a HO game made me smile every time. I wish there were more HOG with bright colors. Why do we have to wait til Christmas to get something light hearted and cheerful! Enjoy! Rated 5 out of 5 by clpond53 from Excellent! This is by far one of the best games I have ever purchased from Big Fish. 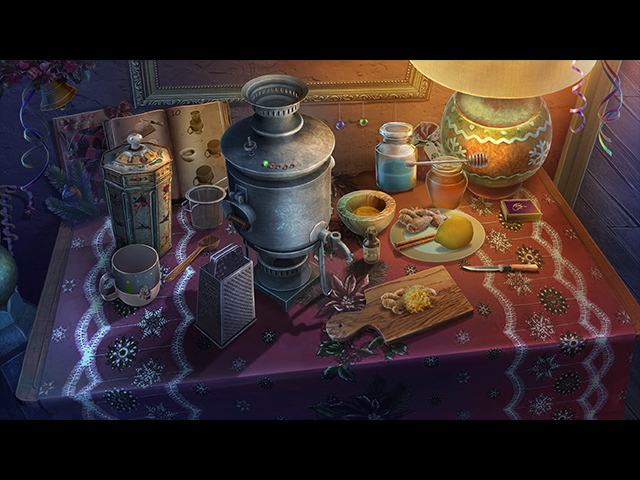 The hidden objects and puzzles were challenging. The game play lasted longer for me than most of the recent games. The graphics could have been better. I like more of an interactive background. Some of the voice-overs were a little annoying. I especially appreciated the fact that I didn't have to constantly hop back and forth from room to room when an object was found. Rated 5 out of 5 by kandikc from Fun Christmas Game I really enjoyed this game! The length of game play in the main game alone was way better than other Christmas games. The visual was great and it had a storyline that you could follow easily. If you like super hard and boring puzzles then this game is NOT for you! It's a great casual game with wonderful background Christmas music! I played the game for an hour and was motivated enough to wrap 10 presents and would play for another hour etc. This is a great game for the person that enjoys a fun stress free game! Rated 5 out of 5 by reidun70 from Great game! Just played 1 hour but that hour was great fun! love christmas games, no darknes just joy. Bought it and look forward to do the rest of the game. Rated 5 out of 5 by Collydoll from Best Game in Years! I absolutely loved this game! I want to say a huge thank you to the Developers, wow! Lots of game play, great graphics and story! Well done! Merry Christmas and a Happy New Year to all at Big Fish and gamers! Rated 5 out of 5 by juliedv5 from Just WOW! Best Christmas game so far. The music, the graphic, the puzzles... everything is a delight. Way better than the others Yuletide Legends! Rated 5 out of 5 by Monkeygus from A Challenging Christmas Present This is based on the demo. I was pleasantly surprised at the challenge that this Christmas game offered. Even the HOPS were difficult... and I consider myself an above average player. When I purchase this game (which I WILL! ), I'm going to start over and hopefully do better than I did on the demo! The storyline was interesting to me because the character of Krampus is such a unique being. It's nice to see him as the villain. I LOVED the "Barney Fife" cop at the police station! The elf's voice was sort of annoying, but at least he is not a helper within the game. Overall, the graphics are bright and colorful (as a Christmas game should be), the sound/voices were good and the game play was challenging. Fun Factor? 5 STARS! I have read other reviews saying this was a long game, so I will assume that it is... even though there are very few chapters. I'm looking forward to continuing the journey that this game will take me. As always, try to demo for yourself. I think you will be pleasantly surprised. Merry Christmas y'all from Tennessee!